The appliance is usually assigned where hydraulic is already being used with tool, rotary pulsatory or special machines. However heavy loads, extremely powerful machining and a considerable amount of switching require the assignment of the hydraulic rotary indexing tables. This appliance type distinguishes itself with its low energy consumption and high frequency of switching. This appliance type distinguishes itself from the „PEX“ design with its economical consumption of power when frequently switching. Likewise here the piston limit of travel is assessed by the built-in electrical control. These limit switches are connected with the magnet valves or the hydraulic unit via an electrical control. The respective program controls offer manifold possibilities such as oscillating motion, differing fractional pitches and other functions. The switching time of the division is dependant on the amount of material conveyed by the hydraulic. This can be calculated with the already existing calculation. 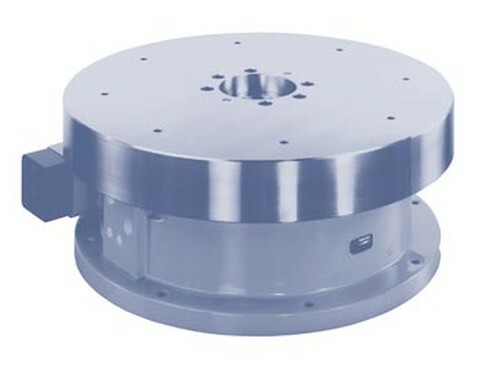 T-slots in the table plate, 90° degree angle plate, stationary limit switches instead of the electrical limit switches, pneumatic weight compensation, double drive cylinders, differing fractional pitches on to integrated NC control. The larger RST HEX types of design with their enormous interlocking power against distortion or tilting are to be used with big loads. 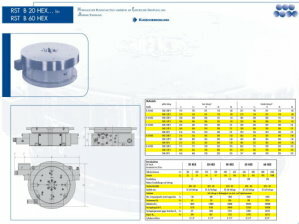 This „PEX“ series type was developed for use on rotary pulse special machines or installation ones. There is enormous force ensuing from this small size of appliance. The piston travel limits are scanned via built-in electrical limit switches and correspondingly linked up with two separate 5/2 directional magnetic control valves. This external directional control offers manifold possibilities such as reciprocating action or differing fractional pitches. The switch cycle can also be interrupted for other functions. Since there are more control possibilities on special machines, these valves can be integrated into the control box. 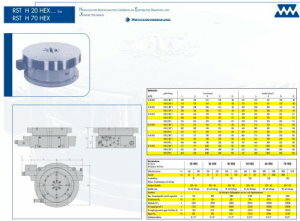 With these PEX designs all the pistons are fitted with their own compressed air supply. This produces optimum performance averages and leads to the fastest switch times. Via separate one-way restrictors the elevation and interlocking movement can be set to suit the built-up load. T-slots in the table plate, pneumatic valves or stationary limit switches instead of the electrical limit switches, pneumatic weight compensations, double drive cylinders, differing fractional pitches on to integrated NC control.